All war. No love. Madeleine’s been hurt too many times in the dating scene to let Byron beat her in some huge prank war. They’ve had their deserters, their POWS, their casualties, but no one can risk losing the battle of the sexes. Except now something strange is happening at the college...and it’s not just the students. Buried deep beneath the pranks is real danger, and the only other person who suspects is Byron. Should Mad join sides with him or does that mean forfeiting her heart to the enemy? A prank war sounds fun doesn't it? I couldn't help but he brought back to my old college dorm days while reading this. Good times! Ah, to be single with virtually no responsibilities. Those were the days. There are some really good ideas in here if you are the prankster. I wish I'd had this book years ago! 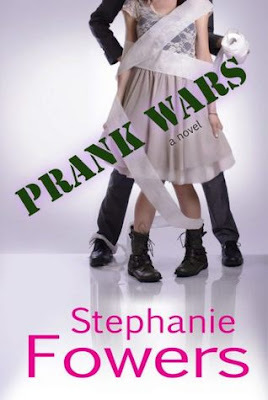 I really liked the whole "prank war" theme that started it all. There was a romantic tension that was keeping my interest and I was really looking forward to how it was going to end. I did like Madeline and Byron a lot. I loved their playful attitudes yet also knowing just where to push each others buttons. I wanted more kissing. I always want more kissing, but this book could have really used some good scenes. I'm a sucker for the romance and kissing you know. But, there is an element of mystery here. It almost didn't fit. I literally could not figure it out. I'm usually pretty good at these things but I just had absolutely no idea where this book was headed. I've got a small problem with this book. I enjoyed it. I did. It was fun and I couldn't put it down. The beginning reads like a contemporary romance. Really fun and light. You know Mad Dog is going to have some issues to work through and you hope that Byron helps her. But, the mystery story here just didn't fit for me. I liked that it kept me guessing but when you finally figured it out it just wasn't plausible. I hate saying that but it just wasn't. It would have been so much better if the whole elaborate scheme was cooked up by Byron and his wing men, as well as Madeline's roommates, to teach her a lesson and finally end the prank war. In the process getting the girl to fall for the guy. That would have been brilliant! Or what about taking the whole boyfriend for a week idea mentioned and running with that. Mad and Byron are forced to be in a relationship for a week to finally stop the prank war and get to know each other but in turn fall in love. Those story ideas would have been more realistic and kept with the light feeling of the beginning of the story. It would have fit better. The mystery aspect and the actual reasons for what was going on were just too far fetched. It never would have happened. I overlooked it in the name of fiction.